The first mention of the name Harache so far discovered occurs in Spain and dates to 1487 when a Jew named Abraham Harache was arrested in the town of Allariz for blasphemy and speaking against the Virgin Mary. From it we learn that the family was originally Jewish but it seems that somewhen soon after this event, probably in 1492 following the 'Decree of Expulsion' which dictated that all Jews must leave Spain taking none of their possessions with them unless they became Christian, they converted to Christianity. Notwithstanding this conversion the family must have left Spain since the name next occurs in France in 1563. A mark plate held by the Goldsmiths Corporation of Rouen, which was raised in that year following the destruction of the earlier plate during the sacking of the Goldsmiths' Hall the year before, records the names P. Harache and I. Harache together with their marks (see NOTE 1) and this shows us that goldsmithing was the chosen craft of this family. The first written archival record of the family suggests that these inscriptions refer to Pierre Harache, who was born in 1545 and died in 1633, and his brother Jehan both of whom were the sons of Pierre Harache and his wife Jehanne Toustain as recorded by Cassan (see NOTE 2) and both of whom became master goldsmiths in 1570 (see NOTE 3). It would appear however that, although the records are somewhat unclear, there was a third son, Toussaint, although nothing is known either of his birth or his freedom as a goldsmith. Vatinel suggests 11th October 1607 as a date by which he had become a master goldsmith (see NOTE 4). 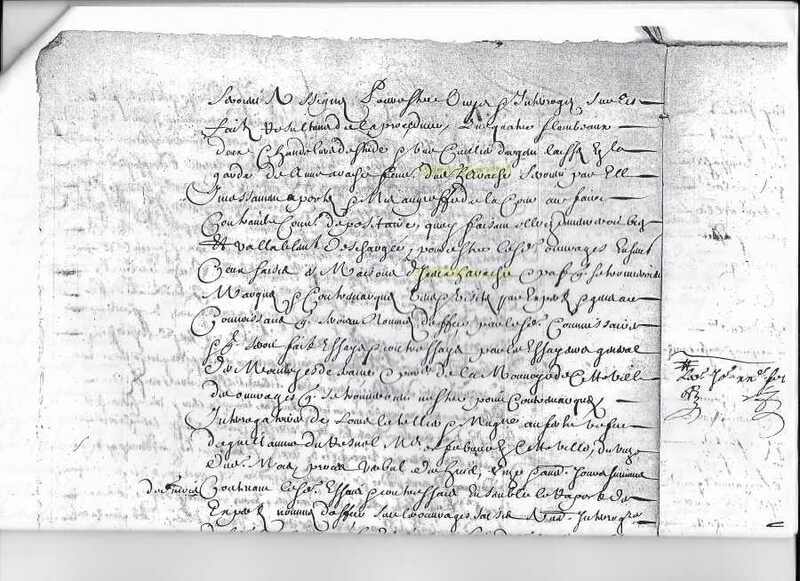 The families of Pierre and Toussaint are both recorded in Rouen and it was from both of these families that members traveled to London in the 17th century but of Jehan there is no further record. There is, however, a record in 1668 of a family of Haraches in Paris (see NOTE 5) and logic dictates that this Parisian branch of the family must have sprung from Jehan who would have gone to Paris soon after becoming a master goldsmith in 1570. This would account for the lack of further records in Rouen of this member of the family. Those members of the family who left Rouen for London have been fairly thoroughly researched and accounted for and all are shown to have worshiped at the Huguenot church at Quevilly, on the outskirts of Rouen, which was opened in 1601 following the issuing of the Edict of Nantes in 1598. However a mystery has arisen surrounding various records in London of Huguenots named Harache who cannot be shown to have come from Rouen and the obvious explanation is that these members of the family must have come from Paris. See family tree showing possible Parisian branch some of whom could have come to London. Current assessment of these records shows that there were two male members of the family and three female members, none of whom is directly connected with those family members who came from Rouen, but it is altogether possible that others will come to light. There was a Pierre Harache who was a ratepayer at Little Newport Street between 1700 and 1709 (see NOTE 6) and it seems that this was the year of his death although to date no burial record has been found. 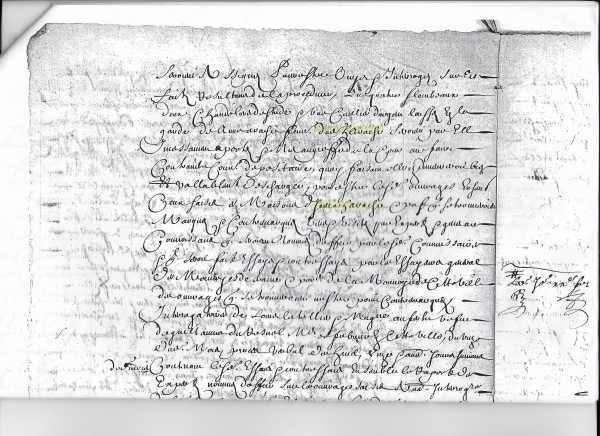 A Jeane Haresche (sic) acted as a witness at the baptism of Susanne le Francois on the 30th July 1710 (see NOTE 7) and nothing more is known about her at the present time except that she was a widow. She was presumably the widow of the Pierre Harache who ceased to be a ratepayer in 1709. A Jean Harache is recorded as a ratepayer at Little Newport Street between 1703 and 1713 (see NOTE 9) and according to the late Brian Beet he died in 1716 (see NOTE 9). Le May records that he took out an insurance policy at this property with The Sun Insurance Company in 1710 (see NOTE 10) but again nothing more is known of him at present. He may have been the Jean Harache whose name appears on a document written in Paris in 1668. See photocopy below. The records at Swallow Street church show that Gabrielle Harache was given away in marriage, to a merchant named Antoine Morgan, by her father Pierre Harache on 8th January 1693 (see NOTE 11). Her address is not given in the records but the possibility must be that her parents were the Pierre Harache and Jeane Haresche mentioned above. Lastly Mademoiselle Susane Arache acted as Godmother to Susane Ester Sain, daughter of Philipe Sain, goldsmith, of Little Neauport Street (sic) at her baptism on 29th October 1704 (see NOTE 12). Could she have been another daughter of Pierre and Jeane? To sum up: As will be seen it can now be established that a branch of the Harache family not directly connected to the Rouen Haraches was evident in London at the end of the 17th century and into the 18th. They had taken up residence in Little Newport Street where a Peter Harache is recorded as a resident by Hoare's Bank with whom he dealt in sterling and second hand silver between May 1697 and April 1705 (see NOTE 13). I am indebted to Michle Bimbinet-Privat who provided the photocopy documentary evidence of the family in Paris in 1668.